￼Daryl Bailin – nurse, tai chi practitioner, musician, activist, seeker Email Daryl at dbailin@sacredorchard.org. Daryl was born in Petrolia, Ontario, Canada to Verne and Zoe Whatley. Verne, a Baptist preacher turned social worker, and Zoe, a nurse turned music teacher, instilled an appreciation of music, the wonder of nature, a drive to serve, a respect for others, and a love of God. With her older sister Sharon and younger brother Arden, Daryl was active, attending school, making friends, participating in church life, playing piano, singing around the campfire, presenting marionette shows, and various crafts. Early years included trips to the Pinery Provincial Park or the family cottage on the Maitland River, both winter and summer. School and college years were a time of discovery, meeting people from different backgrounds, and coming to terms with her gifts and weaknesses. Studies at McMaster University in Hamilton, ON, were interrupted with a trip to Europe, and after several changes in her major, she graduated with a BA in Psychology. A brief marriage to Michael McLarty in 1979 ended within months. The death of her brother Arden, who took his own life, shook her. That Christmas was spent in the hospital where her aunt Lois Whatley was recovering from surgery. Everything changed after that. For the next decade, Daryl sought answers, to questions she did not even know. She went from job to job, as an art director at a Boys and Girls Club, a waitress, and a typesetter. Suffering from chronic fatigue, she discovered naturopathy and tai chi. As her energy came back, she began to feel chi, the flow of electric-magnetic energy. During early efforts at meditation, she started to hear the inner nadam, the vibration of the universe. On a vacation to Ananda Ashram for Christmas in 1984, she met George Bailin for the first time. However, not until the following summer, at a healing arts festival at the ashram, did she realize that George was to be her husband. 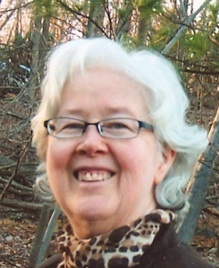 During the festival, Daryl attended workshops offered by many of the popular new age people of that time, but it was programs with Shri Brahmananda Sarasvati that held her attention. In those first few days, she learned what true meditation was. Finally, all the questions were answered, all the doubts were addressed. She spent the next eight years in frequent attendance at his meditation programs, learning Sanskrit and chanting, Yoga and Vedanta, and leading kirtan. Since 1986, Daryl has been living with George in Monroe, New York. She began to edit his writing, and soon was helping in getting his works published. In 1995, they cofounded Sacred Orchard, intending it to be a vehicle for promoting spiritual awareness. For 11 years, George wrote and Daryl edited Meditator’s Newsletter, a monthly publication of poetry, prose, essays, spiritual quotes and exercises. To make ends meet, Daryl went back to school in 1988 for an ASN in Nursing from Orange County Community College in Middletown, NY. She practiced medical-surgical and critical care nursing before finally landing in hospice nursing. To be in the homes and presence of the dying and their families was a privilege for her. She retired as a nurse in 2012. After Shri Brahmananda passed away in 1993, George encouraged Daryl to join him for services at a Methodist church he had started attending. Inspired by the pastor, Daryl became a lay preacher for the next decade, and sang in the choir. Encouraging George to reconnect with his religious past, they both began attending services at a Reform temple. Daryl discovered a love of Hebrew chanting and the liturgy of the service, and both completed the Bnai Mitzvah program. Daryl sings in the choir and leads Shiva Minyan services at people’s homes. Daryl continues to teach and practice Tai Chi. She has had many demonstrations of the beneficial effects, including increased energy and quick recovery from injuries. She lives with George and their dog Gracie in a wooded community in Monroe NY. Daryl and George meeting at Ananda Ashram in 1985. Daryl singing at the Healing Arts Festival at Ananda Ashram 1985. 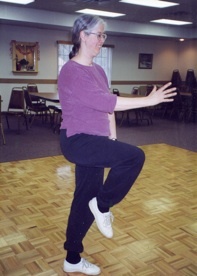 Daryl demonstrating tai chi to students at the senior center 2000. Daryl wrote and produced the Xmas eve programs at the ashram for many years during the 1990’s. 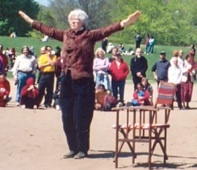 Daryl demonstrating Tai Chi in a Chair for World Tai Chi Day 2006. 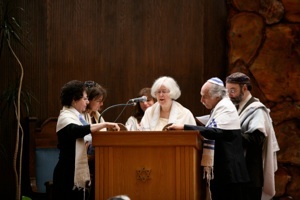 Daryl chanting Torah, George and Rabbi Loeb at her side, with class of Bnai Mitzvah at Temple Beth El in Monroe NY.